Source: James Dougald McRacken and Red Springs War Memorial, Red Springs. This bust pays tribute to the 90th Infantry Division hero James Dougald McRacken, known as the "Le sauveur de Mayenne [the savior of Mayenne]," for his heroism in World War II. 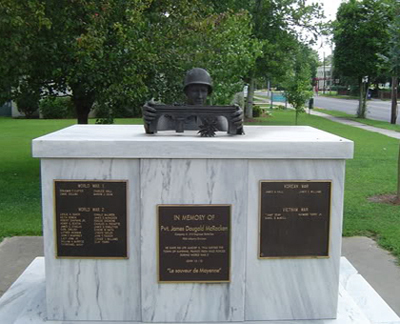 Dedicated to James Dougald McRacken, the sculpture sits right on top of the Red Springs War Memorial (1978) that commemorates the service of other soldiers from Red Springs who have died in World War I, World War II, the Korean War, and the Vietnam War. The bust is composed of a large, rectangular block of polished marble, approximately six feet long by four feet high, and a sculptural rendering of the soldier and bridge set in the top of the stone. The sculpture depicts the arms, shoulders, and head of Private McRacken, as if rising out of the marble, as his hands hold a miniaturized representation of the bridge. The Red Springs War Memorial constitutes the marble base placed and dedicated in 1978 as a war memorial to servicemen from Red Springs fallen during World War I, World War II, the Korean War, and the Vietnam War. At that time the plan called for a sculpture depicting a wounded serviceman protected by a fellow soldier to be sculpted in Italy. The base was to have been dedicated on Memorial Day 1978 and the sculpture on Veterans Day 1978. It is assumed that funding was an issue as the base was not dedicated until Veterans Day 1978 and the sculpture was never added. It was unadorned except for the incised inscription. The memorial in effect remained incomplete until 1994 when the McRacken sculpture and bronze plaques were placed. Center plaque: IN MEMORY OF / Pvt. James Dougald McRacken / Company A 315 Engineer Battalion / 90th Infantry Division / He gave his life August 5, 1944 saving the Town of / Mayenne, France from Nazi forces during World War II / John 15:13 / "Le sauveur de Mayenne"
"Hero of Mayenne Is Reburied In Red Springs," The Robesonian (Lumberton, NC), October 19, 1948, 6. Vaughan, John. “Hometown Memorial To Honor N.C. Solider,” The Robesonian (Lumberton, NC), August 4, 1994. The sculpture was dedicated during observance of the 50th anniversary of McRacken's heroic death at Mayenne, France. Private James Dougald McRacken died in attempt to save a bridge from being blown up by retreating Germans in Mayenne, France during the American advance in August of 1944. McRacken was wounded by a hand grenade explosion after leaving his truck or tank to disarm the explosives placed by the Germans. Despite being mortally wounded, he succeeded in cutting the wires and saving the bridge. Many townspeople witnessed his heroic effort and honored him shortly after with a monument placed near the bridge. He was subsequently buried close to the bridge. In 1948 his body was returned to his home town of Red Springs, and the citizens of Mayenne renamed the bridge in his honor. The sculptor, Paul Van Zandt, is a retired emeritus professor of sculpture at the University of North Carolina at Pembroke. James Dougald McRacken bust and Red Springs War Memorial are located in front of the Red Springs town hall on South Main Street. They are on the right side of the walkway leading to the entrance with the front of the memorial facing the walkway. A Dwight D. Eisenhower Green Ash Memorial Tree is right behind the memorial. The memorial is located on a paved area in the lawn in front of the town hall.